Learn about how the landscape was shaped in Kirkheaton. Kirkheaton overlooks the Calder Valley and the former industrial core of Huddersfield. In this walk we can see how the natural properties of rocks and geological settings have been vital in developing both industry and economies. Starting at the Church, walk up hill to ascend Grenoside sandstone. You might notice that much of the building stone here is much darker than Elsewhere in Kirklees. This is because the position of Kirkburton high above Huddersfield allowed the chimney smoke of the town below to accumulate at this altitude and react with the sandstone, to become blackened. Coming off Jagger Lane you come across some dry stone walls that are in disrepair. This is because of a poor choice of building material. You can see that the faces of the bedding horizons in the stones sparkle. This is because of the presence of the mineral muscovite mica. This mineral has abasalcrystal form, which means it splits into very thin layers along one of the crystal planes. The mineral has many important applications, but in this instance produces a weakness in the bedding planes of the rock which is exploited by weathering elements. Where the mica splits, so does the sandstone. After you have climbed up Jagger Hill you will come across the first of many exposures that can be found on this hillside. This is the top of the Greenmoor Rock, with the beds of the same thickness repeating up the sequence and you can see that evenin situit resembles flag stones, so naturally, this is what it was quarried for. You can also see from the discolouration that the rocks contain iron. See if you can pick out some nodules. Further around the hillside you will come across some more crags of Grenoside rock, that have been supported by a stone wall. 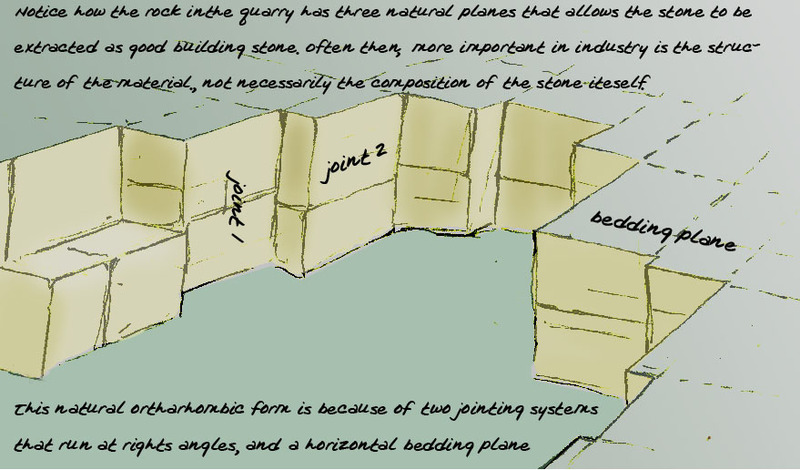 You can see how the naturally occurring sandstone is ideal for building such walls, as it is quite difficult to discern where the bedrock ends and the wall begins. You will then enter the former Dalton Bank Quarry, from which high quality buildings stone was extracted up until the 1950s. It is very clear which properties this sandstone has that make it suitable as a building material. From a distance you can see that there are three naturally occurring lines along which the stone will break. There is abedding planethat is horizontal and flat, and twojointing systemsthat happen to almost be at right angles to each other. This is fortunate, as it means the rock can be extracted without the need for muchdressingby a mason. More importantly, the rock ishomogenious;there is not a great deal of variation of material throughout the rock face, with the size and shape of sand grains, and the cementation of sand grains being consistent. Down in the valley you can see the former ICI plant, which still depends on geological minerals for production of numerous industrial chemicals, importing from quarries and mines around the world. As you walk down (and then back up) Cockley Hill lane back in Kirkheaton, you can see a large landfill site in the distance. As you get closer you can see how this is in fact an old quarry that is now being used as a site to bury household rubbish. Choosing a landfill site is very difficult, and the properties of the bedrock geology are paramount. The quarry used to supply clay to local brick works. This means that here the bedrock is made up of clays and shale, which are not very porous to water. A problem with land filling is the potential forrun-offfrom polluted water. However, if the underlying bedrock is non-porous, this can be mitigated. Hence why this is a good site for a landfill. As you get nearer you may also notice the geotextile layer underpinning the site, which further ensures landfill run-off does not leech into surrounding groundwater. A last site of interest on the walk is a very old quarry that is found after you turn past Lascelles Hall cricket ground. On your left you can see a large hole in the ground that was used to extract stone. If you look at the exposed face you can see that the strata are very thin and brittle. Can you determine what this stone could be used for? With these properties, most likely dry stone walling, or roofing.